They may not get much coverage, but Lompoc Brewing is releasing beer in the six-pack format for the first time in its 20-year history. Six-packs of Pamplemousse Citrus IPA and C-Note IPA will soon appear on store shelves throughout Oregon and Washington. Why, you may fairly ask, would they launch six-packs after so much time? The press release offers a partial explanation in the form of a quote from Lompoc owner, Jerry Fechter. It's true about 22 ounce bombers. They're everywhere. And the bomber market is increasingly occupied by newcomers and, in most bottleshops, by higher end product. Lompoc isn't a newcomer by any means and none of its general release bombers fit the high end profile. So what's the deal? The deal is that established places like Lompoc face a steep challenge trying to stay relevant in a sea of shiny new breweries that have decent beer and massive social media games. Older breweries start to look irrelevant in that scenario, particularly in the eyes of younger drinkers. Putting your beer in six-packs is more of a necessity than a cool option at this point. Six-packs are by far the most popular form of packaging in beer and getting six-packs of your beer on shelves is an increasingly important way to stay relevant. Old and new breweries are doing it, thanks in large part to advances in technology that make six-packs of cans and bottles economically feasible in brewpub-sized batches. In fact, C-Note and Pamplemousse are excellent choices. They fit in nicely with the popularity of aromatic, citrus-forward IPAs. Fechter had a number of beers to choose from and surely chose these because they are exactly what consumers are looking for in 2016. C-Note, the press release reminds, has been around for 15 years and was first brewed to celebrate the Horse Brass Pub's 25th anniversary. Why the Horse Brass? Because, if you didn't know, Fechter's partner in Lompoc was the late Don Younger, owner of the Horse Brass. Fechter has a zillion Don Younger stories and, by the way, C-Note has always been a damned good beer. Pamplemousse is a newer kid on the block, arriving a few years ago. It's lighter in color and body than C-Note and leans on four hop varieties, along with grapefruit juice, to create a lingering bitterness highlighted by citrus notes. These six-packs, packaged by a mobile bottler at the Fifth Quadrant Brewery, will supposedly complement, not replace, Lompoc's current lineup of bombers. We'll see about that. When Laurelwood released Workhorse and Free Range Red in six-packs, Workhorse bombers carried on, but sales of Free Range Red bombers flattened. Could something like that happen with C-Note or Pamplemousse bombers? We'll soon see. 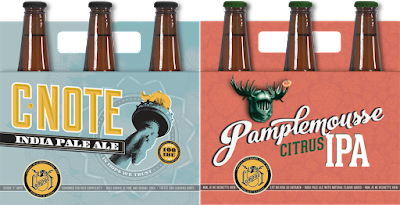 The C-Note and Pamplemousse six-packs are now available at Lompoc's Fifth Quadrant and Sidebar. They will soon arrive at the Hedge House and Oaks Bottom in Southeast, and at the Lompoc Tavern in Northwest. In-house pricing will be $11. Grocery and bottleshop pricing may vary.